In 1880 the Upper West Side was still sparsely-settled farmland. A decade later, however, the area was alive with new construction, pioneered by the 1884 Dakota Apartment building on Central Park West. Most residents had to travel back downtown to attend church services while the neighborhoods were developing. In response, on October 16, 1890, the Consistory of the Collegiate Church formed a committee to search out a site for a new church and school. Three months later the committee had purchased, for $89,000, four residential-sized lots on West End Avenue and three adjoining lots on 77th Street. 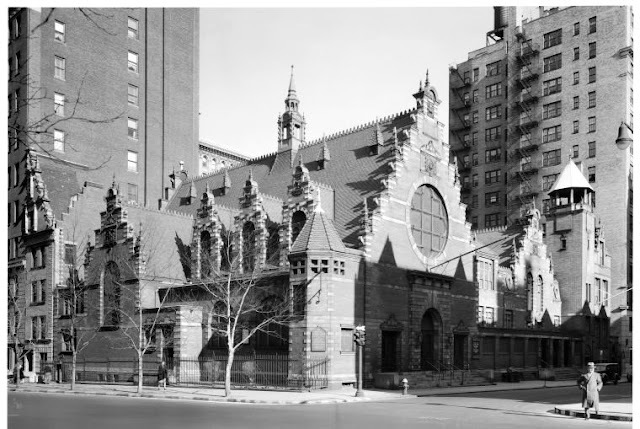 Architect Robert W. Gibson, who was given the commission, veered far from the customary Gothic Revival or Romanesque churches expected on New York streets. Drawing from the city’s early heritage, the firm designed a charming Dutch Colonial structure with a stepped gable and Baroque finials. West End Collegiate clung to its Dutch connections and during World War II established itself as a headquarters for aid to Dutch refugees and relief efforts. Twice during this period Princess Juliana of the Netherlands visited the church. A fire in the sanctuary during the 1980s necessitated extensive restoration and reconstruction, headed by Hall Partnership Architects, LLP. and in 1999 another restoration was initiated, focused on the roof and terra cotta, by LZA Group. So do I, Maureen ... and the snow in the pics that Alice took for me makes it all look very beautiful.